As a result, the recruiting firms are having a hard time distinguishing themselves significantly from their competitors in terms of facilitating the hiring of capable talent. Generally, astute networking/relationship techniques and fancy tech/graphics/analytics support are deployed to gain favor with current/potential clients to ensure steady a stream of business and the more successful ones are generally run on the principle of ‘who they know’, rather than, ‘what they know’. However, such ‘tried and tested’ methods are increasingly being upstaged with the rapid induction and deployment of AI-enabled entities that marginalize ‘human talent’ considerations due to their perceived and actual benefits. The aforementioned process starts with a current/impending/projected vacancy becoming open that leads to a decision pertaining to the availability of any technology, especially, AI-enabled, that can economically, productively and qualitatively do the highlighted job better than a human. There are three paths shown as a consequence of such a decision, i.e., ‘I don’t Know’, ‘Yes’ and ‘No’. This path is an acknowledgement by the HR/talent acquisition/leadership function of the organization grappling with the current/impending/projected vacancy that they don’t have the expertise to gauge whether an alternative to hiring a human exists in the market. Consequently, it prompts the designated/assigned person to seek internal/external assistance in terms of gaining a firm answer in the respective context. An example of internal support in the respective context is the IT function since they are normally the premier source for technological advancements for the organization. External examples of soliciting information include, OEMs (Original Equipment Manufacturers), vendors/resellers of relevant Tech/AI-enabled equipment, Tech/AI-themed shows/exhibitions/conferences, etc. This path is a resolute affirmation of the existence of an effective alternative/replacement for the human talent to perform the functions of the current/impending/projected vacancy. 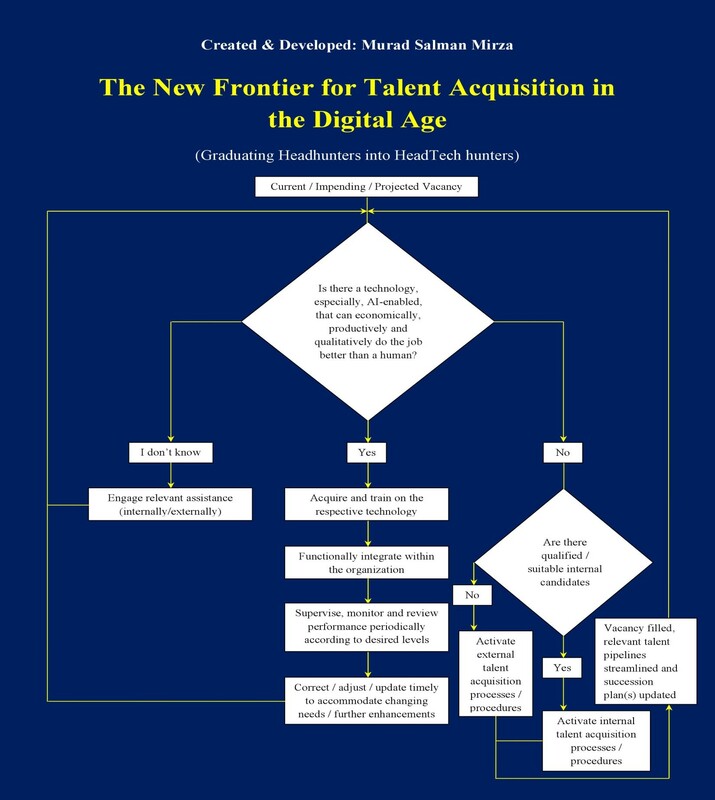 It provides an incentive for the organizational leadership to explore/consider/invest in the technology, especially, AI-enabled, that can provide cost-effective and highly-efficient way of achieving their strategic/operational goals and gain a profound business edge over their competitors without running afoul of any applicable labor laws/rules/regulations. It entails the acquisition and training on the respective technology, especially, AI-enabled, by suitably qualified personnel who will be fewer in number and with a much higher level of technical skill set required for the conventional human-to-human engagement. It will require careful functional integration of the respective technology, especially, AI-enabled, with the applicable interfaces (human and non-human) to ensure a seamless operation. Subsequently, it will require the timely supervision and monitoring by capable personnel to assure and ensure that the respective technology, especially, AI-enabled, is delivering on its marketed/stipulated merit. A periodic review at the senior/top management level on the efficacy of its deployment will provide additional perspectives and any corrective/preventive actions required to avoid derailment of the respective investment. This will also include close coordination/collaboration with the inventors/manufacturers to have additional relevant insights, e.g., on longevity, maintenance, durability, dependability, effectiveness, etc. This path is a firm admission on the basis of available evidence that human talent is still the best option to perform the functions of the current/impending/projected vacancy. Consequently, it leads to seeking suitably-qualified candidates from within the organization in the first instance by activating the relevant internal talent acquisition processes/procedures. In case no internal candidate can meet the job specifications, the relevant external talent acquisition processes/procedures are activated to fill the respective vacancy from outside the organization. Subsequently, the pertinent talent pipelines are streamlined and succession plan(s) updated by taking prudent measures in minimizing any disturbances and associated risks.